Member JimmyR caught our eyes this month with his 3-Level System. The two-tone “his-and-hers” design is complete with clean lines and sleek organization to allow for undistracted listening, while the Klipsch rooftop system creates a lively social scene for parties you never want to end. His transition into audiophilia began when he made the solo move from his birth country of Australia to Greece in 1999, and found that hearing music reproduced on an excellent system had a transformative effect on him. AGON: When and how did you make the transition from casual listener to Audiophile? I have been a lover of music since I was very young, but didn’t really start listening as an Audiophile until 1999, when I moved to Greece. I still remember buying my first audiophile system: an Accuphase integrated amplifier and some very large Klipsch speakers. Having being born and raised in Australia but moving, alone, to an essentially foreign country, I was of a certain emotional state and, as a result, was easily drawn into the “transportation effect” of two-channel audio. Hearing a great piece of music on a great system was simply a magical experience and I quickly became an addict. Despite being a poor country, Greece has some of the most devout audiophiles in the world and, being Mediterranean, they know and love their music and are very passionate. But, being ‘Mediterranean’ also means not having the most, let’s say, “honest”, importer/dealership system and, as a young, inexperienced audiophile, I was led down various wrong paths when it came to component matching. As I became more attuned to what a well-balanced, hi-end system really sounds like, I started my long quest to find what I was looking for amongst the myriad of dealers who insisted that the companies that they happen to represent perfectly match each other. And so, I have gone through countless systems over the last 13 years, from all-out Jadis to Nagra systems, from Zingali speakers, Avalon Acoustics to Verity Audio. I have also lived with all the ‘opposing’ topologies – from single-ended 845 tube amplification to various solid-state set-ups, from traditional dynamic speakers to electrostatics and from turntables to CD transport/DAC separates. Of course, I have also experimented with countless cabling ideas, from Siltech to Purist Audio Design, as well as power conditioners, rack systems, room treatments and hundreds of tweaks. Many of these changes were a result of me trying to find the sound I wanted and simply changing systems as a whole, instead of finding the right combination of components and changing only the element I needed. I also started to realize that different sound qualities don’t always mean differences in quality of sound, but rather different sonic signatures that come down to personal taste. I am still looking for changes, but now I have learned to relax, appreciate what I have… and ‘enjoy the music’. Of course, my addiction to audio and systems is also in the home theatre domain, and I have undertaken many journeys in that arena also. I have experimented with various surround-sound audio processors and, as a Videophile, I have experimented with video projectors (including the old CRT projectors) and now have a Runco LED projector, which I love. AGON: What piece in your systems could you not live without? Gee, I can’t answer that. I can’t live without any piece, unless I replace it with something else on the same day! Having three separate systems (the high-end system in the basement, the ‘wife’s system’ in the lounge room and the out-door setup on the deck, I can instead say that, amongst those 3 systems, I could not live without my high-end setup. 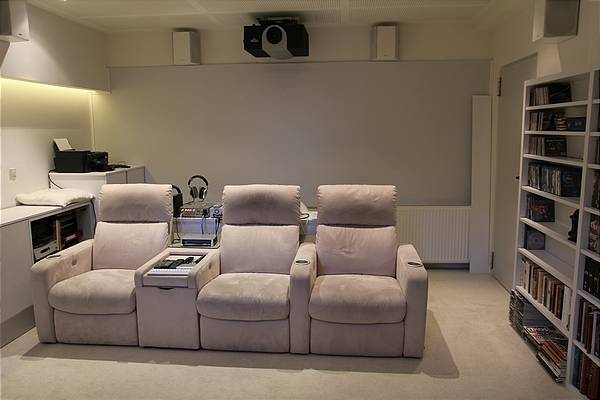 AGON: Which room treatments in your main listening room were the best investment? Room treatments are something that I have not had too much experience with in the past as I have never previously had dedicated audio rooms but, having now experimented with room treatments, I can honestly say that it is one of the most important ingredients to a well-balanced sound. My approach was to absorb sound in specific parts of the room so as to allow for those “healthy” reflections to exist and, as a result, avoid an over-dampened room. The treatment that made the most difference was a custom application of 3-inch foam panels on the wall behind the main system which are covered in a very thin white material so as to not have that hard-core studio look. To see more of his 3-level System and list of components, click here. Do you have a Crib you’d like to share with the community? Click here to submit your Cool Pics and tell us about it!